See? This is a perfect example of why politics can be so exasperating. After years of stonewalling by Michigan Republicans bought off by billionaire Matty Moroun owner of the Ambassador Bridge, Governor Snyder figured out a way to get approved a second span from Detroit to Windsor. Canada agreed to finance the whole thing. All the United States had to do was pay for the construction of the customs plaza on our side. The Democratic Obama administration was loathe to do this last year, lest Republican Governor Snyder be able to hold up this as an important (and voter popular) accomplishment in his reelection campaign. Okay, fine, but now it’s not an election year, and the money still isn’t there. 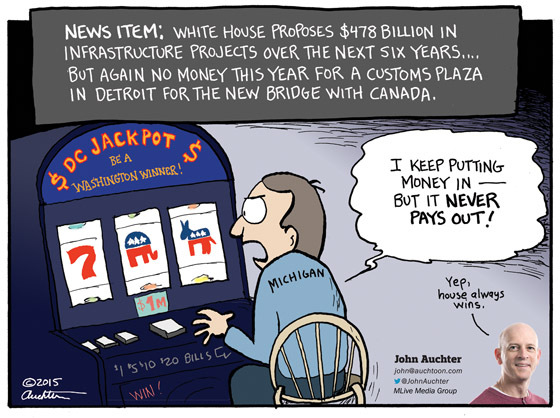 Michiganders dutifully keep feeding our tax money into the machine, but nothing ever seems to come out. What’s the problem?